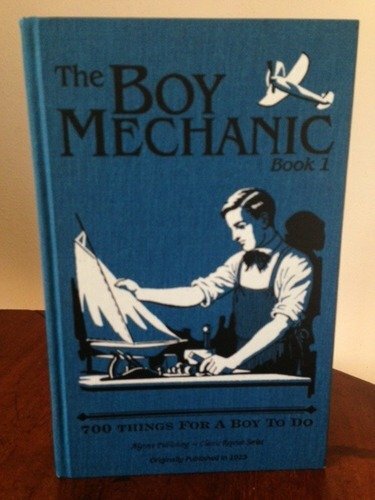 At the end of this blog post, John reminisces about the "Boy Inventor" literature his father used to enjoy. I happen to have a number of examples lying about my house. They are jam-packed full of useful technical information, and are also completely unacquainted with current standards of safety and propriety. John joking wondered whether there were ever articles like "How to Electrocute Your Own Cat!" I just happen to know this volume contained that article, so I took a picture of it. I am reluctant to jinx the situation by mentioning this, but has anyone except David Brooks noticed how much the situation on the ground in Iraq has improved since the publication of the Abu Graib pictures? Peace seems to have settled on Falluja, indeed a peace that involves some continuing American presence. Meanwhile, Moqtada al-Sadr's insurrection is starting to look like Wesley Clark's presidential campaign, except that Clark did not actually have Democrats demonstrating against him. Brooks suggests that the prospect that the US might actually lose has concentrated the minds of responsible Iraqis wonderfully; they are now keen to get a working political system up and running while there are still Coalition forces on the ground. Even the insurgents at Falluja, or some of them at least, seem to have decided that honor has been satisfied. Hostility to the US will hereafter be expressed chiefly by political parties, rather than by militias. In short, the Jihadis' Spring Offensive has failed. Did the Abu Graib pictures actually facilitate this? A terrorist attack on presidential candidates could throw the US into unprecedented political turmoil. So why do so few people want to talk about it? Actually, I myself broached some questions along these lines on New Year's Day, in the same blog entry in which I so presciently forecast the success of the Dean campaign. I do worry about this, often, but I am reluctant to discuss it, particularly online. Snoopy machines might detect my speculations. This could lead to awkward interviews with the Secret Service, particularly if one of my speculations turned out to be correct. You know what happens when American intelligence catches you. Both Republican and Democratic party bylaws allow their national committee members to fill vacant nominations for president and vice president. But if there is not time enough for party leaders to pick a replacement before the election, they would have to ask supporters to vote for the dead men and trust them later to pick an acceptable replacement. This would lead us once again into the mysteries of that 18th-century cuckoo clock, the Electoral College. Some delegates are bound by the law of their states to vote for the party of the candidate they were nominally chosen to represent. Those who are not so bound, however, might not feel obligated to do so if that candidate could not serve. Some of the issues The Globe raises are not actually different from the confusion the Electoral College could occasion even with both candidates in perfect health. This system needs an upgrade. I am reading a book about engineering and popular culture, entitled Inventing Modern: Growing up with X-Rays, Skyscrapers, and Tailfins. It's by John Lienhard, a noted professor of fluid mechanics. He introduces yet another perfectly defensible definition of "Modern," this time as the spirit of the first half of the 20th century, when art nouveau turned into art deco, and technological progress meant "higher and faster." There are all kinds of interesting things in the book, which is packed with cool illustrations from the period. What caught my attention, however, was his discussion of the old "Boy Inventor" literature. My father used to read this kind of stuff; some faded books and manuals were still around the house when I was growing up. The wonderful thing about this material is that it antedates the age of small-minded tort litigation. Respectable youth publications told their readers how to build substantial rockets, even how to build gliders: readers were encouraged to jump off a cliff. How far did the editors go, I wonder? Were there ever articles like: "Boys! Build Your Own Gallows! "; or "How to Electrocute Your Cat!" There is, of course, an old Ray Bradbury story called "Boys! Grow Mushrooms in Your Basement," in which the mushrooms were probably evil aliens, but I'm pretty sure he made that up. The game started as a simple pet project to learn the system: Fries programmed a Master Chief sprite, had him move and shoot. But instead of calling it a day, he pressed on to make it a full-fledged game using the same limitations of most Atari 2600 games: create it using just 4 kilobytes of data. The game was to have a level that featured a driveable Warthog, but not only did it push the size of the game over the 4K limit, according to Fries it also wasn't that much fun to play. So he scrapped it. 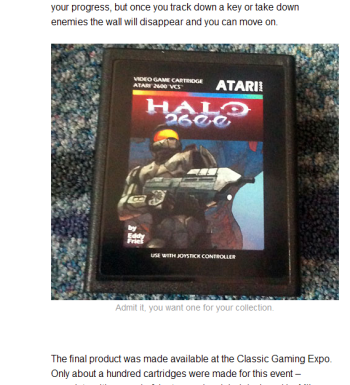 Halo 2600 has a very "Adventure" feel to it: players control Master Chief in a non-scrolling exploration design. There are 64 "rooms" to explore with a variety of enemies to shoot, including a final boss – but first you have to find your gun. Energy barriers can impede your progress, but once you track down a key or take down enemies the wall will disappear and you can move on. A fun project for the Magistra Scientia. We are chronically short of space in our apartment, so we decided to transfer the spices to these magnetic spice tins from World Market. We just needed somewhere to put them, because the kitchen is far too small to put them on the fridge. So, with a piece of sheet metal, some molding, and the hooks from an over-the-door closet mirror, a magnetic spice rack was born.